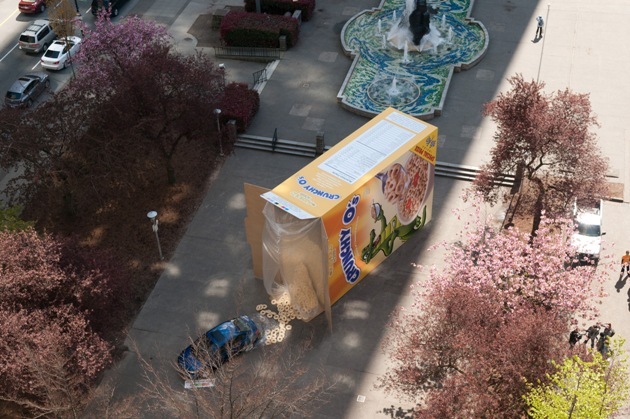 For this week’s post we’re going to take a tour through some of the best and most original guerrilla marketing campaigns of the past few years. Guerrilla Marketing was invented as a way of promoting products and services without the need for big budgets or fancy equipment. All you need is a vivid imagination and a bit of time on your hands. The aim is to provoke thought within the consumer, which in turn generates a buzz and excitement surrounding the brand in question. The campaigns are usually positioned in locations to catch people by surprise, so at the train station or in the park. The idea is that when you’re not expecting an advert you’ll be more likely to enjoy it and process the message. The TV series ‘True Blood’ set up these clever but quite chilling ads in New Zealand. Fans of the show will know that wooden stakes serve as the only weapon to successfully kill vampires; so the missing stakes are slightly unsettling! 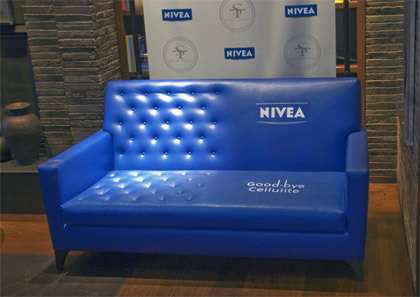 These sofas were positioned around the ‘Miami Fashion Week’ event to promote Nivea’s ‘Goodbye Cellulite’ product. Using an everyday object to represent a skin issue has worked well in this case, especially the comparative aspect. 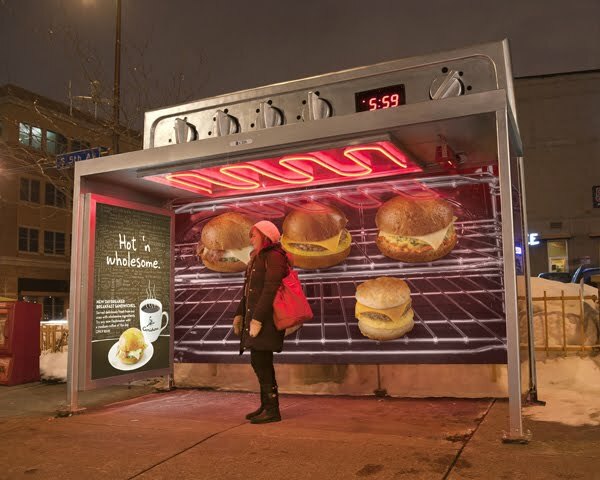 Caribou Coffee in Minneapolis designed bus shelters resembling ovens, to promote their ‘Hot n Wholesome’ menu range. The great thing is, these shelters also doubled up as commuter heaters – perfect for those cold winter months! 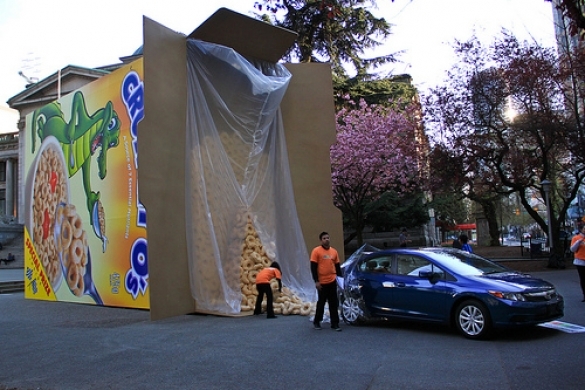 This imaginative campaign for Honda Civic in Canada was executed earlier in the year. It plays on the excitement we all had as children to find a free toy in our cereal packet. I’m pretty sure they’re not planning to give Hondas away, but the execution is great and it’s an eye catching and original idea. Not a good place to sit if you’re feeling hungry! 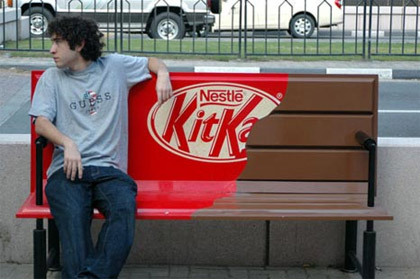 This Nestle Kit Kat bench shows the simple use of an everyday object which fits the product perfectly. 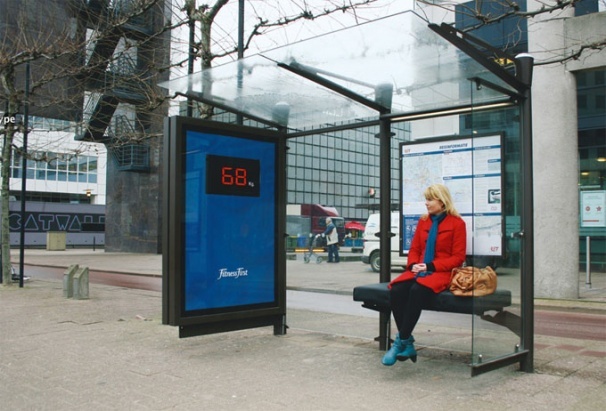 With Kit Kat’s famous slogan ‘Have a break …have a Kit Kat’, what could be more appropriate than a bench? These two are perhaps the simplest idea we’ve seen so far. At first glance these look exactly like barbeques. Once you realise they’re drains it prompts an element of disgust at the idea of grilling your food on a waste disposal area. 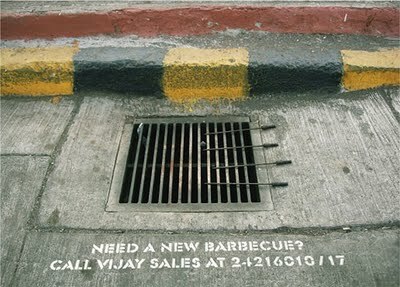 This in turn might make you question whether your barbeque is in good shape. 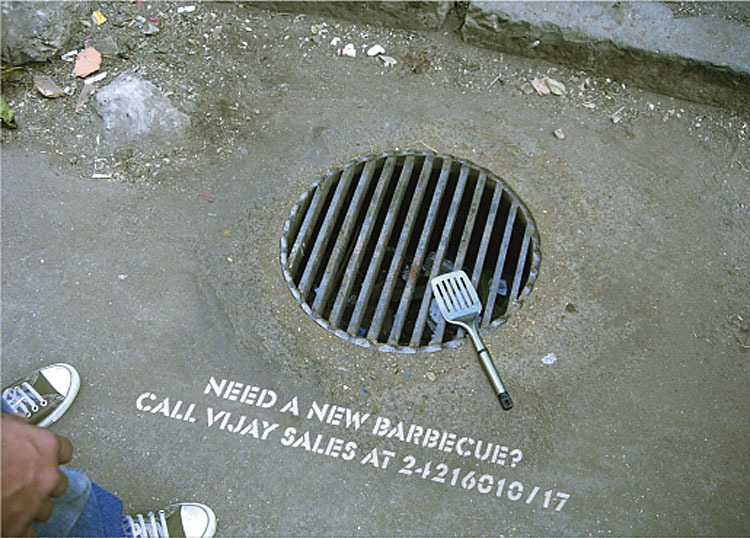 All in all, this is a really good example of minimal budget creating maximum impact in a campaign. What do you think of these examples? Reckon they’d make you like a brand, or would you be more influenced by a big budget TV ad? ~ by skysfridayblog on June 10, 2011. This entry was posted on June 10, 2011 at 9:00 am and is filed under Uncategorized.You can follow any responses to this entry through the RSS 2.0 feed.You can leave a response, or trackback from your own site.